Amazon chief executive Jeff Bezos. Online retailer Amazon.com’s decision to buy Whole Foods Market Inc. and its chain of brick-and-mortar supermarkets is a lot less shocking than it sounds. In fact, some industry analysts say a deal like this was inevitable. Amazon, they say, needs hundreds of traditional retail stores before it can fulfill the ultimate ambition of founder Jeff Bezos — to become America’s dominant shopping destination for pretty much everything. The reason is simple: Despite the hype, Americans don’t spend all that much online. According to the US Census Bureau, Americans last year spent $395 billion at Internet stores, or about 8 percent of total retail purchases. 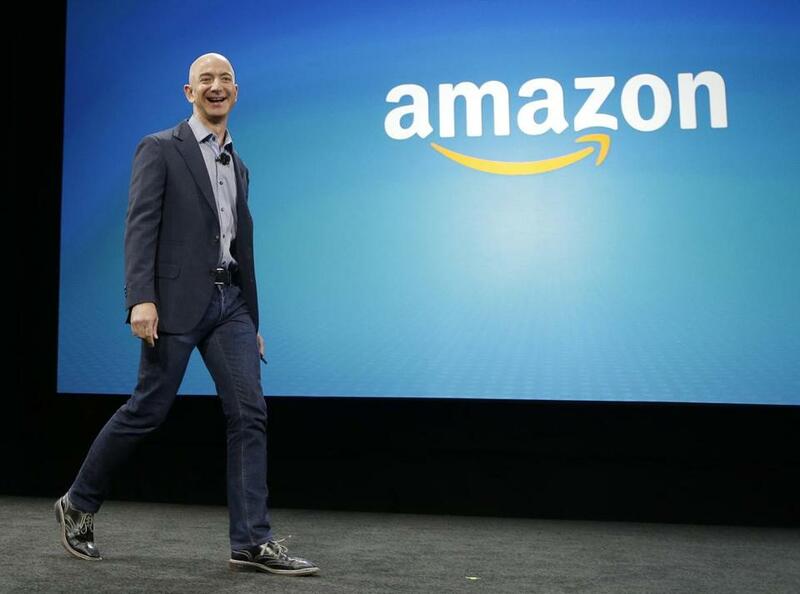 Amazon was the big winner, posting US net sales of $90.3 billion. But that’s just 2 percent of the $4.8 trillion in US retail spending last year. By paying $13.7 billion for Whole Foods and its 460 retail stores, Amazon can reach millions of shoppers in the real world. It’s the company’s biggest foray into physical retail stores, but not the first. Amazon has opened several bookstores in the United States, including one in Dedham. The company also is developing Amazon Go, a new kind of convenience store that would eliminate the need for human cashiers. The first such store was supposed to open in Seattle this year but has been delayed because of problems with the customer tracking technology. In addition, the New York Times in March reported Amazon is considering stores that would sell furniture, electronic devices, and appliances. 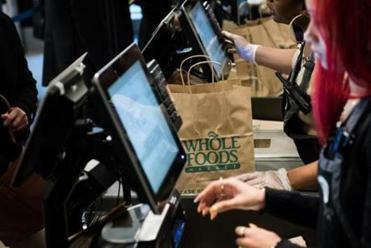 Upscale grocery store Whole Foods Market is set to be acquired by e-commerce behemoth Amazon.com. Read: Will our Whole Foods purchase history now come back to haunt us? While Amazon is serious about brick-and-mortar retailing, Brendan Witcher, principal analyst at Forrester Research in Cambridge, said the company will leverage Whole Foods as a way to win more online business. Witcher said many Amazon customers buy an item or two every now and then. But everybody buys food at least once a week. “When Amazon wins the weekly shopper, they have the opportunity to sell them everything,” he said. Amazon’s archrival, Walmart, already uses its stores to attract online customers. Hundreds of US Walmarts offer a “click and collect” service. Shoppers can order merchandise online, then pick it up at the same Walmart store where they buy their milk. It’s designed to create loyal Walmart consumers, both offline and online. The acquisition of Whole Foods lets Amazon offer a similar service, to keep its existing shoppers loyal and to attract new ones. But Jetta warned that to get the most of the Amazon-Whole Foods deal, “They’re going to need to do something to expand their appeal beyond the high-income urban millennials.” He said about 45 percent of Americans making more than $100,000 a year shop at Whole Foods or Amazon, compared with just 20 percent of those who earn less. Amazon has already taken this to heart; last week the company said it’s cutting the price of its Amazon Prime subscription shopping service from $10.99 a month to $5.99 a month for people receiving welfare benefits or food stamps. Barry Lynn, director of the Open Markets Program at New America, a liberal think tank in Washington, said federal antitrust regulators should step in to block the Amazon-Whole Foods deal. But Jetta said traditional grocers won’t be overwhelmed by Amazon’s arrival on their turf. “For context, Walmart built 3,500 supercenters in this country,” Jetta said. Yet despite that kind of market saturation, other supermarket chains like Kroger’s, Albertson’s, and Stop & Shop weren’t blown away, he said. “They are still in place and probably stronger than ever,” Jetta said.